Industry analyst Greg Grishchenko examines the rising level of quality products, retail display, home production and consumer choice in the world’s largest landmass tissue market. The unique nature of the tissue paper business among the majority of paper industry segments has assured its success and continuing growth across the world for the last 50 years despite local wars, natural disasters and economic difficulties. calamity after 2014 caused by several waves of economic sanctions after territorial conflict with Ukraine. Despite growing oil prices and significant government spending on energy, transportation and industrial projects (including several privately funded greenfield tissue mills), the highly expected recovery of the Russian economy did not occur in 2017. As a result, the anticipated improvement of Russian consumer’s purchasing power did not happen, leaving GDP uncertain in 2018. Despite that, Russia’s tissue market with about 550,000 tonnes consumed in 2017 continues to grow. According to Euromonitor International, tissue retail segment sales while coming across 76% of 2012-17 growth rate and 12% of 2012-17 compound annual growth rate, in 2017 grew, however, only 5.8% compared to 2016. In Russia, tissue retail dynamics are driven by the toilet paper segment share (about 70% compared with about 55% in the USA and Western Europe). Russia’s economy shows growth by implementing its “import replacement” strategy that was introduced in 1998 when financial default caused acute local currency devaluation. This strategy might help to reduce tissue products imports to 5% of total value while at the same time increasing export to Asian markets, mostly jumbo rolls. 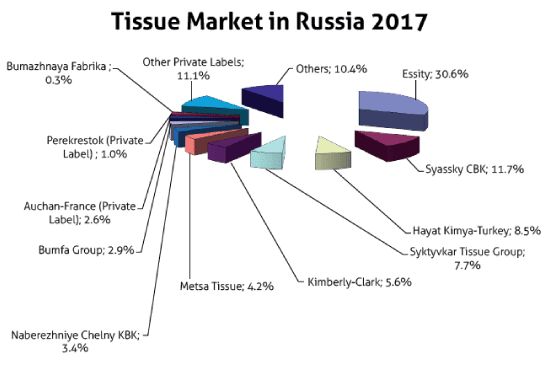 The competitive setting in the Russian tissue market remained steady in 2017 with many powerful players and one leader, Essity, holding nearly one third of all value sales. Even if top local companies were robust players, mainly in toilet paper and facial tissue, the major multinational players – Essity, Kimberly-Clark and Metsä Tissue – held nearly half of all tissue retail sales. In the ongoing competition between domestic and international players each side uses its own strong attributes to maintain their market shares. International companies employ globally well-known brand names, significant financial and advertising support and comprehensive business experience. However, local players such as Syassky and Syktyvkar (number two and four respectively) are gradually reaching world quality standards and offer competitive products for price sensitive Russian consumers, especially during uncertain economic development. Group (Republic of Komy – 1987), Atlas- Market (Sovetsk – 1988), Bumazhnaya Fabrika – Chaltyr (Rostov-na-Donu – 1988), Naberezhniye Chelny KBK (Republic of Tatarstan – 1988), SCA – Svetogorsk Mill (1998), Kuban-Papi (Krasnodar Region – 1999, Nikmas (Chelyabinsk – 1999), PKF Chisty Dom (Moscow Region – 2004), Bumazhnaya Fabrika – Adischevo (Kostroma Regio – 2004), Nega (Kazan, Republic of Tatarstan – 2006) and Viva (St. Petersburg – 2007). While the larger local and international mills could allow themselves to invest in the tissue forming and converting equipment from front row suppliers, the rest could rely on second hand or low cost equipment from China and Turkey. The period of the highest tissue industry growth began in 2010. This year was marked by the opening of three new production facilities by SCA (now Essity) at Sovetsk (Tula Region), Kimberly-Clark at Stupino (Moscow Region) and Constell Group at Takhtamukay (Republic of Adygeya). In 2013, Syktyvkar Tissue Group started production of its new greenfield site at Semibratovo (Yaroslav Region). In the same year Pulp Invest spent almost two billion rubles (about $32m) for its new mill with an annual capacity of 30,000 tonnes at Kazan (Republic of Tatarstan). The project was financed by Gazprombank to produce 100 % virgin fibre tissue products. Hayat Kimya became one of the top players in the Russian market since 2015 with the opening of a modern production facility in Yelabuga (Republic of Tatarstan). Its two principal brands Papia, in the higher-priced segment of toilet paper, and the economy brand Familia gradually grew to become leading performers in the respective tissue product segment. cylinder, providing quick tissue content recipe change at 5.6m production width and 2,100m/min. remains a core product of the market. However, the sales of 3-ply toilet paper keep growing and reached 24% in 1-ply toilet paper is still being sold both in virgin and recycled form. Sale dynamics for the tissue categories vary from year-to-year, but in general they follow changes in family income caused by shifting economic conditions. 3-ply bath tissue production shows the highest growth rate (about 10-12%) despite several waves of economic crisis. 4-ply brand product share is very small and represents super-premium segment on the shelves of upscale supermarkets in large cities. Indeed, the tissue market structure in Russia changed dramatically during the past five years. During this time the share of “basic” 1-ply mostly coreless recycled rolls with substandard packaging fell sharply and was replaced with 2-ply recycled or virgin contemporary labelled products in the economy price range. If in 2011 the share of 1-ply bath tissue made about 60% of the market, in 2017 this paper category had shrunk to 12%. While toilet paper shows robust sales growth, the other tissue products still lag behind. towels continued to be considered as less necessary products in comparison to toilet paper and facial tissues in 2017.
their leading position for a while especially in the medium-to-premium price segment. 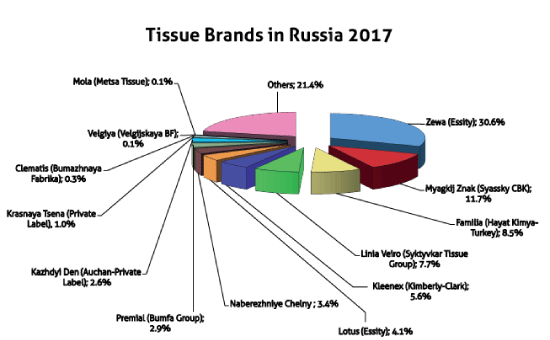 Brands Zewa and Zewa Plus, now owned by Essity, continue to keep the leading retail tissue positions in Russia in 2017 for the key categories of toilet paper and facial tissues. The company continues to invest with the opening of a greenfield tissue mill in Sovetsk (Tula ) in 2010. The other European brand which was competitive in medium-to-premium price segment, Lotus, was introduced at about the same time as Zewa and remained active for long time. cheaper products, it cannot compete with the local brands and private labels in economy bath tissue segment. The latest trend in brand recognition, however, represents a significant increase of high quality domestic brands on sale by all distribution channels. Number two player Myagkij Znak produced by Syassky CBK and number four Linia Veiro by Syktyvkar Tissue Group offer wide range of products from recycled economy to premium 2-ply and 3-ply tissue products. recognisable tissue brand like Pero (Lilia LTD), Reina and Perina (Pulp Invest), Eco- Semeika (Naberezhniye Chelny KBK) and Premial (Bumfa Group). created local “clip mentality” aided by new distribution channels. Ironically, as a result the majority of well-known tissue brands (not only owned by multinational companies) carry non- Russian names written in Latin instead of Cyrillic letters. Even 3-ply premium bath tissue brand Pero (which means feather in Russian) from Lilia Ltd. is written with Latin letters. The exception is the very popular local brand Myagkij Znak (soft sign) from #2 market player Syassky CBK, which is a consonant letter from the Russian alphabet with no phonetic meaning and cannot be depicted in Latin letters. $190m in sales, showing a 5% increase compared with the previous year. Despite a remaining low confidence level in terms of disposable income over the past several years many consumers returned to eating out in consumers returned to eating out in 2017. Moreover, a growing number of international visitors attracted by 2018 football World Cup caused the substantial recovery of the HoReCa (Hotels/ Restaurants/Cafes) food industry segment. to many industrial projects originated by the state and municipal authorities. The share of the HoReCa segment in the AfH distribution business in Russia took about 76% in 2017, with almost no fluctuation from previous years. There is a small growth for business/industry segment share (9.1% in 2017), and a small decrease for hospitals/healthcare segment share (10.4% in 2017). In the public segment share (4.4% in 2017) there is a small rise for a couple of previous years. This data reflects current development of the business environment when recovery of tourism comes along with impasse in industry and health care. to provide stable supply flow, there is still room for others. In recent years a number of local tissue converters (Pulp Invest, PKF Chisty Dom, Atlas-Market, Kuban-Papir and Nega) began to enter the AfH area, offering low cost recycled toilet paper and folded napkins. definite robustness in Russian food retail operations. While the combined share of retail tissue distribution by supermarkets and hypermarkets remains unchanged at about 43% of total value, for the last five years according to Euromonitor International the supermarket fraction keeps gradually falling and the hypermarket one keeps rising. This precedent shows a trend of growing switch from grocery shopping only to more expanded shopping experience for the large metropolitan areas. Popular domestic grocery chains Magnit, X5 Retail Group (Perekrestok and Pyaterochka), Dixi, O’key and others show better growth dynamics than four remaining foreign based chains Auchan (France), Billa (Austria), Metro (Germany) and SPAR (Netherlands). International grocery chains still show good turnover and come up with many new advertising programs despite some players, like headquartered in France Carrefour, leaving the Russian market several years ago claiming unspecified difficulties. private labels to “continuous uncertainty in the Russian economy and depreciation of consumer purchasing power”, some domestic specialists from Rosstat and Forbes Russia also point out growing consumer awareness and education. During my recent travels in Russia I have noticed quite significant improvements in displaying and advertising tissue products not only in big city stores but even in small grocery shops in small and remote Russian towns. 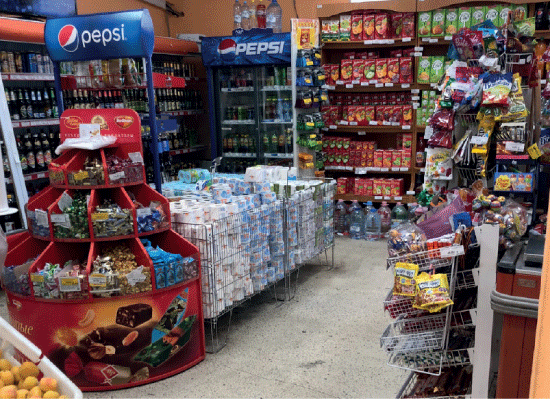 Decades ago, a rural consumer could find only basic recycled poor quality toilet rolls, now even small grocery shop can offer a dedicated isle of tissue products with sufficient selection by price and brand. Current tissue consumption in Russia is about 4 kilograms per person per year and is far behind developed nations. But having in mind that commercial bath tissue was introduced in 1969 and only 10 years ago tissue consumption was less than a half of the current figure, the advance is apparent. picture when several major metropolitan areas like Moscow, St Petersburg and Yekaterinburg show tissue product demand at the European level and the rest of the country is much behind at about India’s rate. 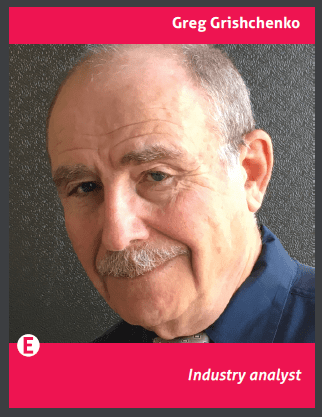 But looking further into market analysis by Rosstat there is an emerging group of nearly thirty cities across the country with the population of around 500,000 each showing higher than average annual growth and tissue consumption. actions is not something new or unexpected to the country’s hardened populace. While the negative effect of such financial hardship is not contested, toilet paper suppliers in Russia today feel as confident as ever. Euromonitor International predicts retail tissue sales rise at modest compound annual growth rate of 2% (at constant 2017 prices) to reach 73bn rubles ($1.2 billion) in 2022. Share the post "Growing consumer awareness and education is driving Russia’s market performance in spite of sanctions"